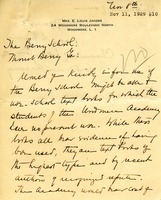 Mrs. Anna M. King writes to the Berry schools in hopes of donating some old clothing. 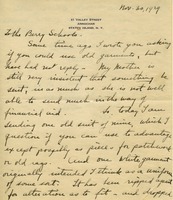 George A. Howells sends a box containing 3 suits and one dress to the Berry Schools. 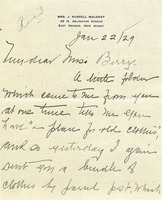 He requests that Martha Berry notify him of the packages arrival. 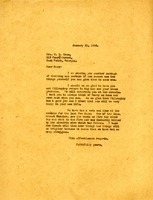 Mrs. J.Y. 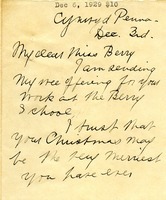 Hall informs Martha Berry that she has sent three trunks of clothing and pieces of material to the Berry Schools. 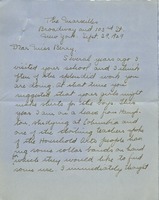 She also sends a check for $3 for cotton to complete the unfinished quilts she sent. 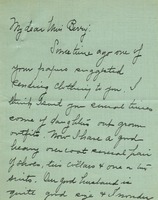 Harriet F. Hall writes that she has sent some of her "daughter's "out grown outfits" to the schools in the past. 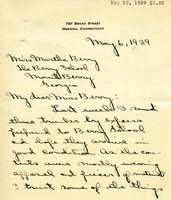 In this letter, she describes various clothing items that she could send to the Berry Schools if they were needed. 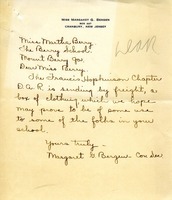 Gift of clothing to the Berry Schools from the Francis Hopkinson Chapter.